Visakhapatnam, also commonly known as Vizag, is one of the oldest port cities in the country. Situated in the heart of Andhra Pradesh, Visakhapatnam is known for its picturesque beaches and serene landscape, as well as a rich cultural past, which makes it an ideal spot for a fantastic coastal vacation. The port of Visakhapatnam is renowned for being home to the oldest shipyard in all of India, and with a plethora of manmade wonders and natural spectacles, Visakhapatnam is a must-visit tourist destination in South India. You simply cannot go to a coastal city like Visakhapatnam and not see its beaches. Vizag is dotted with many beaches along its coastline, with the most famous one being the Yarada Beach. One of the most stunning places to see in all of Visakhapatnam, Yarada beach is surrounded by majestic hills on three sides, and by the Bay of Bengal on the other side. One of the best things about Vizag’s beaches is that they are a lot cleaner and a lot less crowded than other famous beaches along the Indian coastline, and Yarada beach is no exception. It is the perfect place to sit back on the golden sands and witness a marvellous sunrise or sunset. Located a short distance away from Visakhapatnam, Araku Valley is one of the prime attractions of Vizag. Situated at a lofty 910 metres above sea level, Araku Valley is a hill station replete with gushing waterfalls, crystal clear streams, and lush green gardens. The valley is inhabited by a number of tribes who have strongly held on to their vibrant traditions and culture, refusing to let themselves be taken over by commercialization. Araku Valley offers some challenging trekking trails which you can avail if you're up for it. If you’re a history lover, the Borra Caves are one of the best tourist attractions that Vizag has to offer for you. Nestled amidst the Ananthagiri Hills in Araku Valley, the Borra Caves are over thousands of years old and are the biggest among all the caves found in India. Made entirely of natural karstic limestone, the caves are kaleidoscopic in nature, and the light falling on the rocks coupled with the waterfalls creates an extremely colourful effect, lending an aura of magic and mysticism to the entire ambience. The Katiki Waterfalls, situated a short distance away from the Borra Caves, is a gushing waterfall that measures around 50 feet in height and is completely surrounded by the lush greenery of the valley. The crystal-clear water cascading down the rocks, bordered by the gleaming green foliage is a sight for sore eyes. Being a coastal area, the primary cuisine of Visakhapatnam includes seafood, as well as traditional Andhra South Indian cuisine. While Visakhapatnam is not exactly renowned for being a shopping destination, you will still find a lot of things that you can take back home. You can purchase a wide variety of stuff starting from handicrafts to Kalamkari paintings to wooden toys to even gorgeous Pochampalli and Ikat sarees. Kailasagiri is a hill top park in the city of Vishakhapatnam. The hill is at 360 feet and it overlooks beaches, forests & the city of Vishakhapatnam. It is one of the best tourist spots in the city for a bird's eye view of the bay. The Kailasagiri Park is well known for its panoramic view, peaceful atmosphere and its scenic beauty, making it a beautiful tourist attraction in Vishakhapatnam. The place offers plenty of leisure activities which is also one of the reasons for people visiting the place. For small children, circular train is there for fun and enjoyment. Moreover, among adventure games, it gives visitors really good paragliding facilities. Apart from that there are huge idols of Lord Shiva and Parvathi which gives the place a religious flavor. According to the visitors' views, its a great place to visit in Vishakhapatnam to observe the development of the hills over the years. The Kailasagiri Park is a park situated on top of a hill which faces the east coast. Its a place that offers a mixture of things including places of religious importance, adventure games like paragliding, enjoyment for little kids, wide view of the whole city and many other things for the visitors. Araku Valley is located at an average altitude ranging between 600 m and 900 m above the sea level. Spreading over an area of 36 km, the valley is situated on Eastern Ghats and offers beautiful views of valley, waterfalls and streams. The pleasant weather and beautiful hills and valleys make the place ideal for its natural beauty and coffee plantations. Housing more than 17 tribal societies, Dhimsa dance with colourful costumes is the main attraction of the region depicting rich culture and tradition. Itika Pongal is the famous festival celebrated in the region with fervour. Other major attractions of the area include Padmapuram Gardens, Paderu, Sangda Falls, Rishikonda Beach and Matsyagundam. Apart from this, tourists can visit the Araku Tribal Museum for having a glimpse of tribal lifestyle and can purchase articles related to tribal handicrafts. Located on the east coast of India, the Borra Caves are situated in the Ananthagiri hills of the Araku Valley in Visakhapatnam district. British geologist William King discovered this million years old cave in the year 1807 and it has been a tourist favourite ever since. Breathtaking hilly terrain, beautiful landscape, semi-evergreen moist deciduous forests, and wild fauna of the Borra Caves are a visual feast. A marvellous creation of nature, the caves were formed when river waters flow through a limestone area and the calcium carbonate turns into calcium bicarbonate, which is easily washed out by the running water.The most striking feature of the caves is its exquisite variety of speleothems ranging in size and irregularly shaped stalactites and stalagmites. Borra Caves are deemed to be one of the largest in the country and are perched at a whopping elevation of about 705 metres. They are basically karstic limestone structures extending to a depth of 80 m and are considered to be the deepest cave in India. The combination of sunlight and dark conjures amazing dancing shaped in the depths of the Borra Caves which is a sight in itself. Natural skylights in the caves make way for kaleidoscopic imagery that imparts them a unique enigma of their own. Animal lovers will find bats as well as the golden geckos hiding in the shadows of the niches. The journey up to the main destination with its picturesque location and a thrilling hike is a treat in itself. Visit this destination and explore the unique beauty of Araku Valley in all its glory. Submarine Museum is located in Visakhapatnam in the south-eastern state of India. The museum is inside an actual submarine, INS Kurusura, which was India's 5th submarine. The museum is situated on RK beach, near the War Memorial in Visakhapatnam. The beautiful scenery of the clear blue waters and golden sand on the beach serves as a perfect location for the Submarine Museum. It is frequently visited by enthusiasts who want to know more about living in submarines. The museum has artefacts, pictures and articles that share stories of strength, sacrifice and patriotism of the warriors. They give insights on how difficult surviving can be with limited space and resources hundreds of feet underwater. The INS Kurusura served the Indian Navy for 31 years before it was decommissioned in 2001. Post that, it was used a museum to spread awareness about Indian Naval Forces, the technology used and its development in India. It is a one of a kind project that was launched by the Eastern Naval Command. The interiors of the submarine have been re-arranged to allow a clear view to the visitors. It is the only Submarine Museum in the entire of Asia. A visit to the museum is not only a must to gain some knowledge but also to rejuvenate a feeling of patriotism and pride for our country and for the warriors who fought and even lost their lives for our freedom. The Rishikonda Beach is a stunning beach with pristine waters that is located on the coast of the Bay of Bengal in Vishakhapatnam, in the Indian state of Andhra Pradesh. APTDC, which is in charge of this natural beauty, has done a great job in looking after the beach and ensured that this natural attraction remains unharmed. The Rishikonda Beach is thus rightly named as the 'Jewel of the East Coast', owing to its essential and intact beauty. The serene golden sands of the beach are located in the bosom of the Rishikonda hill. The calm blue water of this beach is a sight to the sore eyes, and one can indulge in some quiet, peaceful time with friends and family while at the beach. Located in the midst of frothy blue sea and emerald greenery, the scenery that this beach boasts of is indeed mesmerising and breathtaking. This place is a favourite among water sports lovers because of the range of activities that are offered here. If you are in the mood for an adrenaline rush, you can indulge in the water sports that are offered here. The Rushikonda Beach is one of the few beaches that offers swimming under expert supervision, so do not forget to take a quick dip in the water. However, the beach's natural charms are one of the main reasons for its immense popularity among local as well as foreign tourists. Tourists especially love to take a long walk along the stretch of the sand, and the sunrise and sunset are particularly beautiful here. The Rishikonda Beach is an ideal destination for a peaceful weekend getaway and is located just 8 kilometres away from the port of Vishakhapatnam, making the place very accessible. Dolphin's Nose is one of the popular tourist attractions located in the southern part of the destination. Possessing a height of about 174 metres, the rocky headland is surmounted on an average altitude of 358 metres above the sea level. The name of the place is derived from the shape of the rock, which resembles a nose of the dolphin. Being a prime attraction in its natural form, the place is frequently thronged by tourists round the year, which offers beautiful view of the entire city. The place houses a lighthouse that directs ships from the distance of around 65 kilometres. In 1876 due to cyclone, the earlier lighthouse was damaged; however, the present lighthouse possesses the facility of cyclone forecasting. Besides being an army base camp for Britishers in 18th century, the place is also a popular picnic spot among locals of the region. Some of the popular attractions located in close vicinity include Ross Hill, a temple on Venkateswara hill, St. Johns Church and a tomb named Ishak Medina. Kambalakonda Wildlife Sanctuary has a wide variety of flora and fauna in their natural habitat. Spread across an area of around 71 square kilometres, it is covered with dry evergreen forest mixed with shrubs and meadows. At present, the forest is under the control of Andhra Pradesh Forest Department, however till 1970, the land belonged to Maharajah of Vizianagaram. The name of the wildlife sanctuary is derived from the local mountain named Kambalakonda. The sanctuary preserves endangered Indian Leopard along with various other animals. Tourists can also spot various species of Russell's viper, Indian Cobra, Asian Paradise-flycatcher, Indian Muntjac and Indian Jackal in this forest. Tectona Grandis, Abrus Precatorius, Catunaregam Spinosa and Grewia Tiliaefolia are some of the popular flora species present in the sanctuary. Although shopping is not a widely popular activity here in Vishakhapatnam, you can still find a few good thigs to take home from here. Walter Upland, Jagadamba Junction, CMR Central and Lepakshi Emporium are some of the popular shopping destinations. This city is quite famous for its wide varieties of saris such as Pochampalli and Ikat among the rest. You can also purchase handicrafts, Kalamkari paintings and Kondapalli wooden toys. Vinis Fashion Mall along Waltair Uplands Road is perfect for shopping for clothing, cosmetics, and footwear. Jagdamba Junction is the most popular shopping destination among the locals and you can buy the local Pattu saris here. For a shopping experience drenched in the local culture, you should visit the Lepakshi Emporium, which a state government undertaking. You can find native handicrafts, musical instruments, paintings, durries, wood carvings and toys here. Cheria paintings that narrate mythological events, Brass Pooja pots, wall hangings, and vases are a few other things that you can find here. An initiative of the Visakhapatnam Municipal Corporation, Matsyadarshini is a beautiful aquarium and houses countless species of fresh and salt water marine life captured in glass tanks. The Aquarium, established on the shore of Ramakrishna beach, has many marine varieties include the long horn cow fish, butterfly fishes, surgeon major, peacock wrasse, the lion fish, stone fish, red squirrel fish, perch dusky, trigger fish, clown fish, damsels, sweet lip rabbit fish, angels, electric ray, porcupine fish and many more. Matsyadarshini also has in its credit uncommon marine invertebrates. The carpet anemones, starfishes in different colors, tentacle anemones in white and orange, sea anemones in varying colors are all gives a pleasant view. Situated in the city of Vishakhapatnam, the Simhachalam temple is an ornate shrine which is revered to be one of the most important temples in the region. The edifice is perched atop a hill 800 metres above the sea level and is dedicated to Lord Narasimha, who is an incarnation of Vishnu himself. 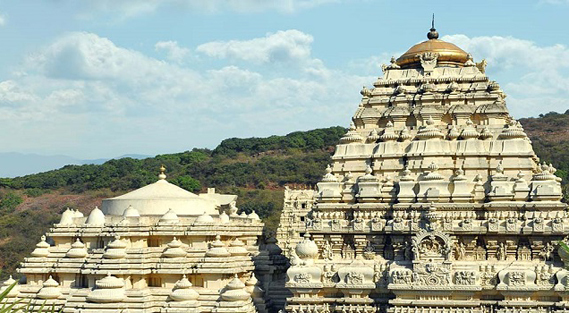 Simhachalam Temple is embellished with extremely detailed stone carvings and design and can be spotted from a distance. This is the only temple in the country where Shri Varaha Lakshmi Narasimha Swami- who is a combination of the third and fourth incarnation of Lord Vishnu- appears. Lord Narasimha appears here in the tribhanga posture and has two hands with the head of a lion on a human torso. A shrine which follows strict discipline, the Simhachalam temple has detailed prayer routines for all days of the year which are undisturbed by the influx of pilgrims. This place is a treasure of traditional Vaishnavite culture, and you can study the same in the routine of the temple and the various inscriptions that it houses. Interestingly, the statue of the deity appears in its true form only for 12 hours per year on the day of Akshaya Tritiya. On any other occasion, the idol is covered with sandalwood paste. Simhachalam Temple has been a source of inspiration to many poets such as KuchimanchiTimma Kavi, Adidam Sura Kavi and the likes, owing to its rich history and strong traditional values. The Indira Gandhi Zoological Park is a scenic location amidst the Eastern Ghats. It is a part of the Kambalakonda Forest Reserve and houses about eighty different species of animals. With its area of 625 acres, this is one of the largest zoological parks in Andhra Pradesh. The Bay of Bengal is situated close by, which makes it an ideal destination to study flora and fauna right beside each other. Perhaps nothing ever delighted us as children than a visit to the zoo, and this destination does precisely that. With its dedicated sections for different varieties of animals such as primates, lesser carnivores, carnivores, mammals, ungulates and birds; this destination houses a vast range of animals. This park also has a separate section for butterflies and moths, which also makes up for an exciting study. This part of the park is open only during the day, as moths and butterflies cannot fly during the late hours of the day. The walls are adorned with pictures and information about these gentle creatures to spread awareness about them. The animal population here is perfectly complemented by the surrounding foliage of the Eastern Ghats, which surrounds this place on three sides. Located in the state of Andhra Pradesh, the zoological park is named after the former Prime Minister of India. The park opened its gates to the visitors on 19th May 1977. The entrance and exit gates of the Indira Gandhi Zoological Park are located opposite to each other. One of the gates is placed towards National Highway 5, and the other gate is placed towards Beach Road at Sagar Nagar. The area of the entire park sums to about 625 acres. It is almost always flocked by tourists, who visit this park to witness the myriad of creatures, namely Rhesus Monkey, Mandrills, Tigers, Pumas, Olive and Sacred Baboons, Panthers, Lions, Jaguars, Wolves, Hyena, Jackals and Ratels. The park also houses Pythons, Tortoise, Monitor Lizards, Snakes, Elephant, Bison, Spotted Deer, Sambar, Pied Hornbills, Painted Storks, Peacocks, Ducks, Cocktails and Macaws. There is even a mini train inside the park to view all of its premises. Ramakrishna Beach is one of the popular beaches located on the Eastern coastline of the country. Situated at the coast of Bay of Bengal, the beach constitutes a large part of the seafront. Often referred to as twin beaches, the Ramakrishna Beach and the Lawson's Bay Beach offer beautiful views of sunset, sunrise and the natural surroundings. Submarine Museum, the Kali Temple, VUDA Park, Matsyadarshini and War Memorial are all lined up near the beach. Offering various kinds of water activities to the travellers, the beach is popular for sunbathing and wind as well as water surfing. Deep sea angling is another prominent activity, which is carried on traditional fishing boats. The Visakhapatnam Urban Development Authority or VUDA park, is a popular attraction in Visakhapatnam and a favorite amongst the tourists. One of its main attractions, here, is a musical waterfall. The park also has a skating rink and many small playing areas for kids. The park is designed and constructed by the VUDA and is in the close proximity of Ramakrishna Beach. Its an ideal spot for a late evening snack, especially if you are with kids. The long beautiful and pristine Bheemunipatnam Beach is located at the assemblage of Gosthani River and the Bay of Bengal. It also houses the remains of a 17th century fort and cemetery, reveling history dating back to the Dutch era. With wild winds and unforgiving waves, most of the beaches of Visakhapatnam are not very safe and tend to have dangerous ides. Bheemilli however, is more at peace and has calm waves, making it a perfect getaway for all the swimmers-at-heart. A salty, refreshing climate, united with the agreeable nature and lush greenery all around dotted with lined palm groves, make Bheemilli a famous and loved beach. Yarada Beach is an entrancing site which is surrounded by hills on three sides and the Bay of Bengal on the fourth, covered with lush greenery and soft golden sands all over. It is an ideal location especially for the nature lovers as one gets to view enchanting sunrise and sunsets on this coastline. The beach is situated at a distance of 15 km from Visakhapatnam and does not remain very crowded. Since not many people gather here all the time, Yarada Beach is by far one of the safest and cleanliest beaches in India at present. The area is covered with coconut and banana plantations. A perfect holiday destination which allows its tourists to spend quality time with their loved ones, the superb scenery gives an ideal backdrop to the Yarada Beach. The hills surrounding the beach make it appear surreal and perfect scenic beauty. Tourists can relax and look at the waves emerging from the sea along with the calm ambience of the beach where one can spend some peaceful moments away from the screeching noise and fast-moving life of the city. The beach is maintained well which is why so many tourists come to experience its beauty from all over the world. The tourists can participate in various activities at the beach including taking a dip in the sea or making sand castles. One should try the local delicacies which are present at the beach. The deep blue colour of the sea, when merged with the golden glow of the sand, makes the beach appear heavenly, and a trip to the Yarada Beach should be on your list of must-visits. Lawson's Bay beach is considered an extension of Ramakrishan beach more than often. It is a calm, serene and secluded stretch with lush greenery and whitish sands. The majestic sea with shallow crystal clear water and calm waves here is ideal for swimming, sun bathing and surfing. This memorial is dedicated to the 'Victory at Sea', during the Indo-Pak war in 1971. A renowned War memorial, it is located in Vizag on the left of the beach road and facing the submarine museum. Many war related materials are displayed here, including a fighter plane, missiles, few bombs and a tank. One of the most beautiful beaches of the town, this one with palm trees and picture perfect sceneries attracts many film and TV serial makers. This beach with soft sands and cool breeze always provides a secluded atmosphere. One also finds here, a modest rock-like structure here, similar to a small island, fascinating most of its visitors. Havi Konda, Thotla Konda, Bojjana Konda, and Salihundam located around Visakhapatnam were places of Buddhist excavations. The excavations of 1906 that took place have brought out many Buddhist monuments such as stupas and chaityas. It is believed that some of the corporal remnants of the Buddha were conserved at these sacred Buddhist places. Dantapuram, another Buddhist excavation site, has been beautifully placed at the confluence of river Vamsadhara with the Bay of Bengal. The excavations in this holy place have exposed many stupas and antiquities.